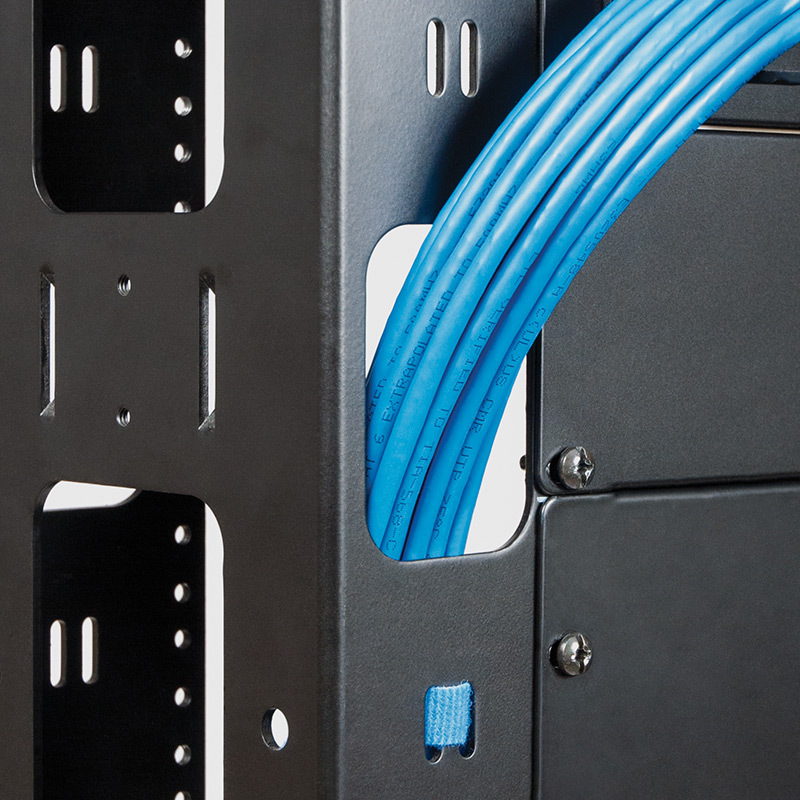 Brackets, racks, and cabinets help support cabling and network equipment in structured cabling systems. Using the right types can help prevent network issues. ICC focuses on strength, ease-of-use, and variety when manufacturing metal products. ICC uses strong metals and adds reinforced features to support heavy weights. The designs are simple, making them easy to assemble and install. ICC offers solutions in various rack mount spaces (RMS) to work in small, medium, and large spaces. ICC’s wall mount and utility brackets offer another choice to medium-sized rack installations. Their small size makes them perfect for areas with very limited space. They come pre-assembled in one piece. Mounting holes are spaced 16 inches apart to align with wall studs. They can be mounted on a wall and hold from 1 to 8 RMS of network equipment. The wall mount hinged brackets are designed with a hinged ear which allows patch panels to swing outward. This feature gives access to the rear without having to remove the entire panel. The brackets can be installed with the hinge on either the left or right side. Similar to the hinged brackets, EZ-FOLD brackets have a patented design. The arms can fold to reduce their size. A smaller carton saves on shipping cost and storage space. Plus, it makes them easy to carry. The arms are also designed with double mounting holes to keep the weight from bearing on the hinges. These brackets are available in 6‑inch and 15‑inch depths. A hinge on the front of the frame lets equipment swing downward 90 degrees. This gives access to the rear without having to remove equipment. The frame also acts as a base to punch down cables onto patch panels. These brackets are available in 12‑inch and 18‑inch depths. ICC’s utility rack comes pre-assembled with the arms folded. To install, unfold the arms, tighten the two bolts, then mount. Network equipment will mount parallel to the wall, so there is no limit to depth. To support a higher amount of connectivity and cabling, ICC offers wall mount racks. These racks can hold from 8 to 30 units of rack mount spaces. They are available in up to 26-inches of depth to provide room for network switches and routers. ICC’s open frame rack comes in four simple pieces: two arms and two rails. The screws come built-in to reduce loose parts. The 30 RMS model includes brackets for extra support. ICC’s swing frame rack comes in three pieces: two brackets and a door. The front door is reversible and can swing open left or right. The swing-out design gives access to the rear without having to unscrew any equipment. Plus, a cardboard template is included to help mark holes for drilling. Enclosed cabinets come pre-assembled and provide a clean place (instead of location) for network equipment. The front and rear have a lock with a key for added security. The rear door is hinged which lets the cabinet swing-out. The cabinet’s front door is available in solid steel or plexiglass. ICC’s distribution and cable management racks are perfect for data centers and telecommunication rooms. These open frame server racks are built for heavy-duty support of equipment and cabling. They can hold up to 45 rack mount spaces and up to 1500 lb. when mounted to the ground. Also, every rail is numbered to identify the number of rack mount spaces. ICC offers two types of distribution racks: 2-Post and 4-Post. They are made of 9 AWG aluminum, making them light-weight and easy to carry. 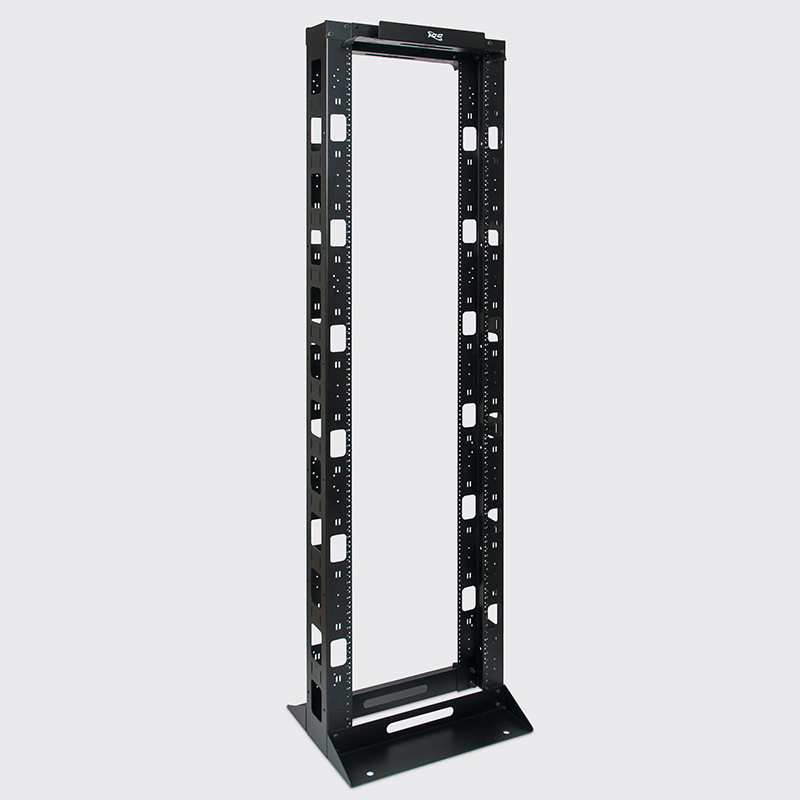 The 4-Post rack has an adjustable depth to hold deeper and heavier network equipment. ICC’s cable management racks are built with cable channels along the top and sides. These channels have cable tie points to help route cables along the structure.